Aqua Stone Humidifier from Telebrands. 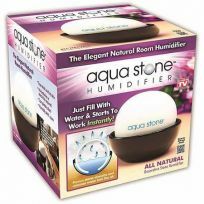 Just Fill with Water & this Elegant Natural Room Humidifier Starts to Work Instantly! Ease Static & Dry Skin - No Batteries or Electricity Required - Completely Silent - Hassle-Free No Monitoring or Cleaning - Humidify Any Room! The natural porous stone absorbs water quickly & releases moisture into the air through evaporation.